Using bold colours and designs within a washroom is just one way we can work with you to create a unique space that reflects your personality. Whether that’s done by adding small pops of colour against a neutral background, or using bright colours and bold patterns throughout a washroom area. We enjoy creating bespoke washrooms and colour often plays a key role in them. Here we’ll take you on a tour of just some of our latest and most colourful projects. The new cycle centre which we installed as part of the Devonshire Square development close to the City of London, is the perfect example of how a touch of colour can be added to a design for maximum impact. 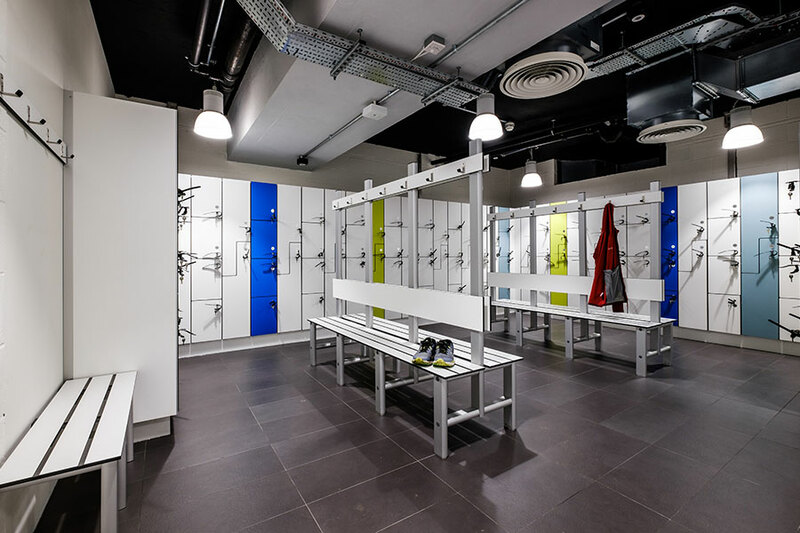 The changing area largely comprises white Legato units and Arpeggio white solid surface trough-style vanity units in white – and while the majority of the Forza lockers are also white, we made the area stand out by alternating the lockers between three other vibrant accent colours. You don’t need to simply add one or two pops of colour to a washroom and changing area – in the right setting, it can also be the main feature. This is exactly what forms the basis of the new trampoline and play park within Sutton Sports Village. The vibrant orange colour scheme is used throughout the centre to create a bright and energising environment for visitors to enjoy. 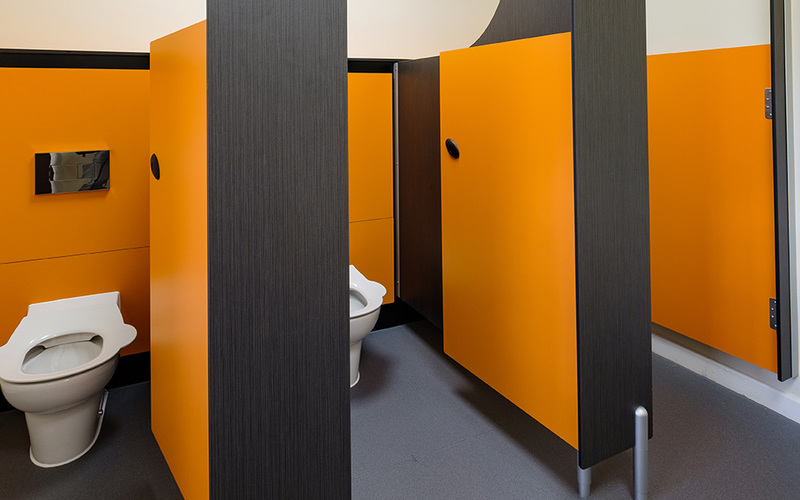 We drew on the same bright shade for the welcome and customer storage desks in the reception area as well our Forte solid grade laminate toilet cubicles to continue the theme throughout the centre. 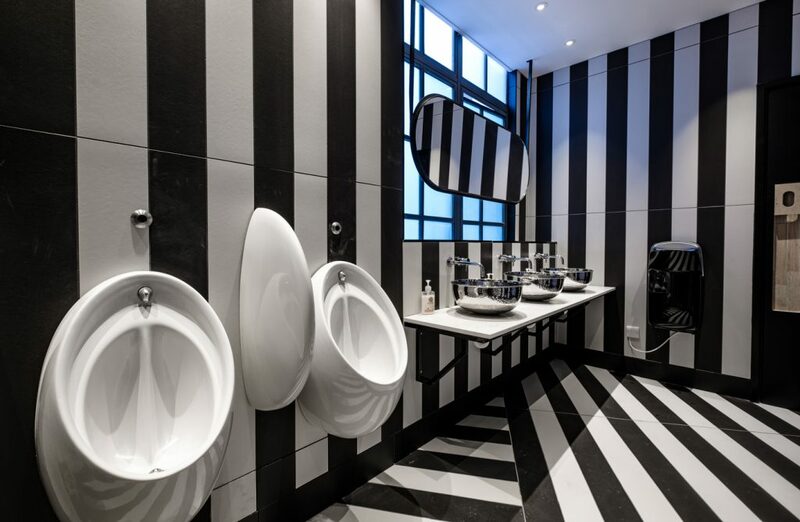 A bold design doesn’t necessarily have to mean using a bright colour palette, as you can see from this eye-catching monochrome washroom design we’ve recently completed. The black and white stripes featured on the walls and floor, as well as on our Alto full height toilet cubicles complement the white Caesarstone quartz vanity unit supported on a blackened steel frame for a washroom that is truly one of a kind. Whatever style you’re looking for our design team will find the perfect match for your next project.